Please note that during the discussion that follows this original post it was discovered by Ixion and Stikpusher that my photograph was actually a location 14 km from Bastogne instead of near the town of St. Vith. Ixion has provided a link to the actual location which will allow you to look around the intersection at a mix of newer and original buildings that existed in December 1944. I‘ve started assembly of three models I intend to use in a diorama called ‘Road to St. Vith’. The event in history occurred on or about 16 to 19 December 1944, see Warfare History link below: I’m looking for clarification on who is in the Jeeps. Fact checking: It sounds like the men in Jeeps along the road to St. Vith were U.S. Army liaison officers rather than military police? My understanding is that during the Battle of the Bulge military police were normally directing traffic and provided some reconnaissance, so to have liaison officers on the road instead of enlisted personnel would be unusual. A Sherman tank of the 9th Armored Division heads into action against the advancing Germans during the Battle of the Bulge. So what are those three models going to be? I sure would love to see some build photos here! I'm attempting to locate the area where the photo was taken. If you examine the road sign, you can barely make out what I believe is "Grande Rosiere" and "Nives". If you Google Maps; "Nives, Belgium", and zoom in closely, you will find a nearby town of "Rosiere la Grande", about 2 miles NW of Nives, which I'm going to go out on a limb and say it's the same town. I'm guessing this photo was taken near the town of Rosiere la Petite, which is in-between Rosiere la Grande and Nives, possibly on what is now "N85", about 6 miles SW of Bastogne. Not a bad bit of photo interpreting and such from the signs. So that might be snow on the ground on the field in the background. But the sunshine was an oddity until the weather cleared and the sun came out around the 23rd. Ok, I missed something here... I inferred the date from the text and the dates given for the actions here, but the photo caption states; "this Sherman of the 9th Armored Division's CCA (switched from the east on December 25th) has reached Petite-Rosiere." So this photo may actually have been taken at a later time than that of the initial advance on Bastogne. It's not really clear from the text, as it doesn't actually address this particular photo. Reviewing Google Maps, I don't find an N15 in or near Petite-Rosiere, only N85, perhaps a typo in BoB, Then and Now, or they changed the name. Clearly our history detectives have discovered a problem with the text and the photo as it was represented in the Warfare History article, plus I added words under the photo in my post that were not in the original text because I believed the photo was taken outside the town of St. Vith. Now the question is do I go ahead with the diorama which would hopefully represent the photograph and change the title, or do I stay with the objective which was to represent the defense of St. Vith during the Battle of the Bulge and change the diorama? I need to think about this a little more. 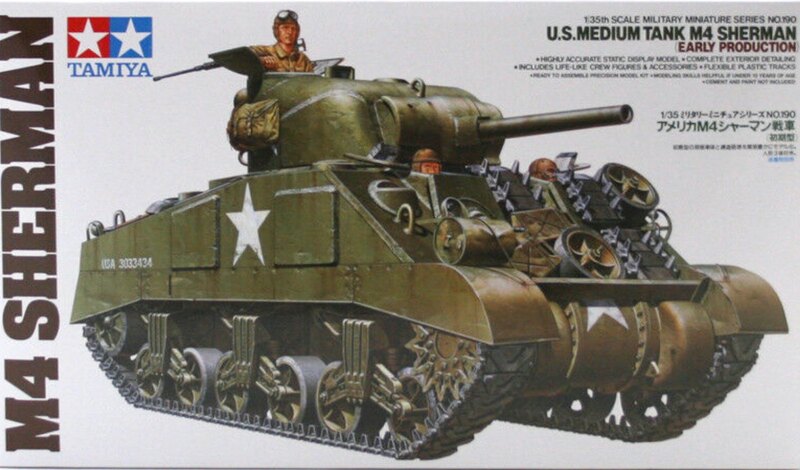 I purchased an M4A3 Sherman and two Willys MB Jeeps. 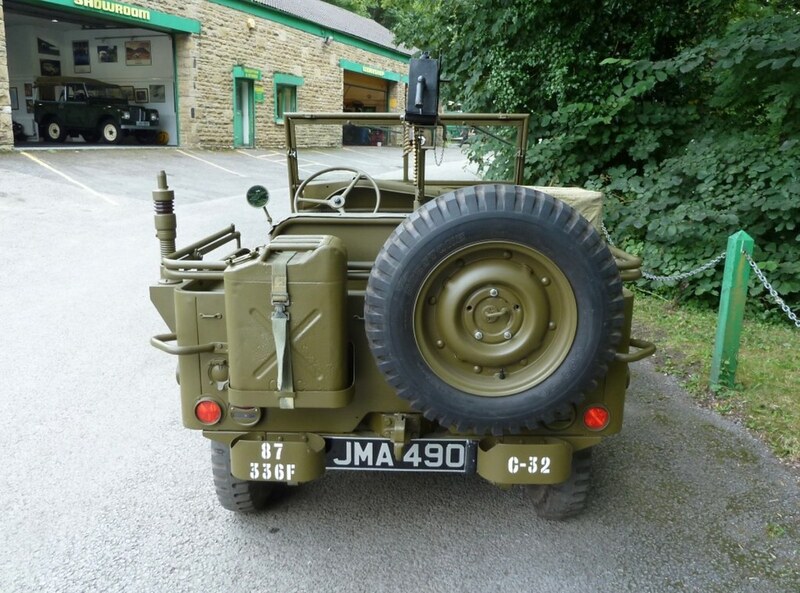 I have also purchased a radio set and stowage for the Jeeps and tank, but nothing is lost here because all these items can be used no matter what I do. Thank you ‘history detectives’ for fast recon. Ixion and Stik, I like the photo and think I would rather change the title of my diorama. If I do change the title what would you recommend the title be based on your detective work? It looks like there are still some historic building remaining despite the more recent development. The large white house just right and behind the barn with the tractor confirms with the photo taken in 1984 in BoB Then and Now, thus confirming the proper location. Wow that link you provided Ixion is great! So the location of my chosen photograph is 2 km from Nives, 14 km from Bastogne, 14 km from Neufchateau and 1 km from Grande Rosiere. Since the major offensive took place in Bastogne it would have the most historical significance and the title of my diorama could correctly be called ‘Road to Bastogne’. Am I correct? Well, the sign says Bastogne, and it is pointing that way... so yes, “The Road to Bastogne“ is a perfect title. Or some variation of that. Just as a side note Sergeant, Vancouver was my hometown. Hazel Dell to be exact. I grew up in Hazel Dell in the 1940’s and early 50’s. My family had a small farm three driveways south of the original Hazel Dell Elementary School on the east side of what is now called Hazel Dell Avenue (Old Pacific Highway). There is a church and three or four newer homes on the property now, but when I lived there it was all orchards and farm land. The house we lived in is still there, but the barn and out buildings for farm animals are gone. This is really exciting Ixion, I was from the Class of 65, although I joined the Navy in 1963. Most of my classmates from Hazel Dell went to Columbia River High School the first year it was opened. I chose to attend the old Fort Vancouver High School because that is where my girl friend went to school. She is my wife now and we have known each other since we were 5-year old (we’re now in our early 70’s). I'm from the class of '77 of CRHS, my chemistry teacher, Larry Cloe, was of the first class, valedictorian in fact. I will look in my Shumway Junior High year book for a picture of Larry. All the students who were Class of 65 at Columbia River and Fort Vancouver went to Shumway. Stik, I wanted to thank you and Ixion again for your time and great detective work that helped me decide to change the title of my diorama. There have been many dioramas regarding Bastogne, but ’The Road to Bastogne’ is about getting to the fight and the sacrifice our troops made who stood in the way of an advancing enemy. You're quite welcome sarge. When I was looking for the info this morning on which combat command of 9th Armored division was where whenthe Ardennes offensive began, I came across the tale of Combat Command Reserve. I had read of it before, but forgotten the details. 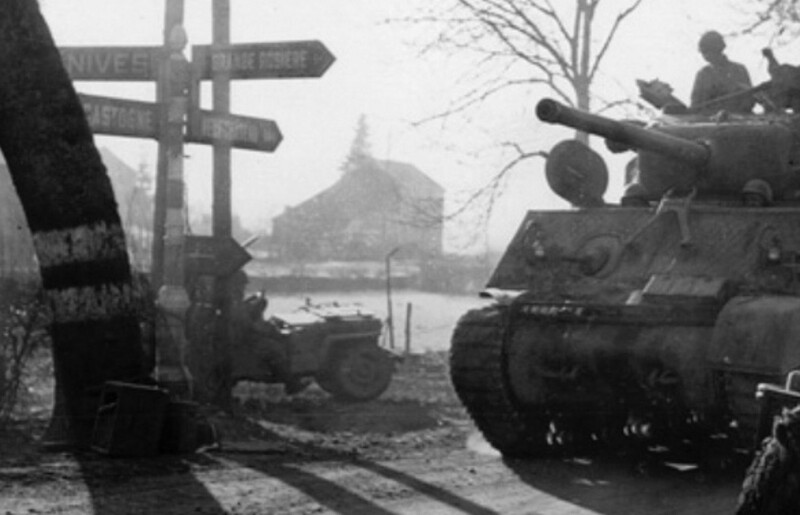 It was broken up into task forces and placed into the path of 5th Panzer Army, to the easy of Bastogne. They were outnumbered and outequipped, had hold at all costs orders, and were eventually pretty much destroyed. Only a few lucky survivors were able to escape being killed or captured. Their sacrifices bought the time for the 101st to get to Bastogne and, along with the surviving elements of 28th Infantry Divison, 10th Armored Division, 705th Tank Destroyer Bn, and several other units, make their heroic stand. Jeep #2 is in primer (Tamiya Liquid Surface Primer thinned 50/50 with Lacquer Thinner) and ready for custom O.D. paint (Tamiya Olive Drab XF-62 mixed with Buff XF-57 60/20 and thinned 80/20 with Tamiya X-20A). 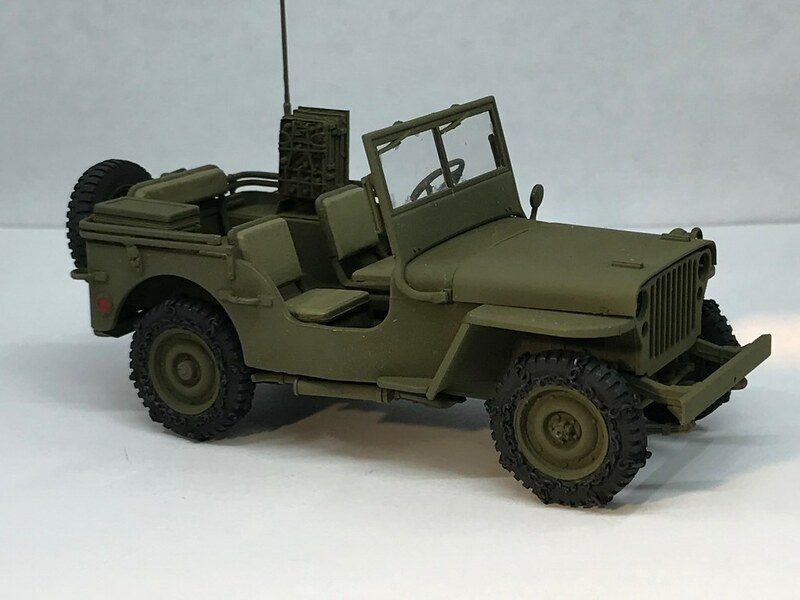 I did not like the results on Jeep #1 below of painting over Tamiya Nato Black XF-69, so I used a nutural gray primer on Jeep #2. This is Jeep #1 with custom O.D. paint, Legend resin BC1306 radio set and Blackdog resin wheels with snow chains. This picture is the olive drab color I'm using as my paint sample. My hope is the nuteral gray primer will make the olive drab lighter and match more closely the color in this photograph. I also decided to add a realistic antenna and base (mast) on Jeep #2. 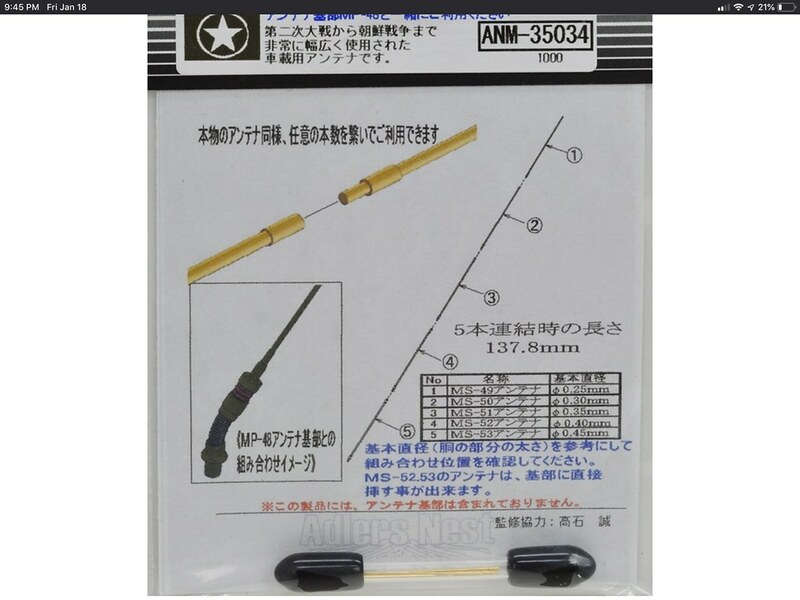 This new antenna not only looks more realistic but can be bent over like the photograph 'The Road to Bastogne' that I'm building the diorama to represent. 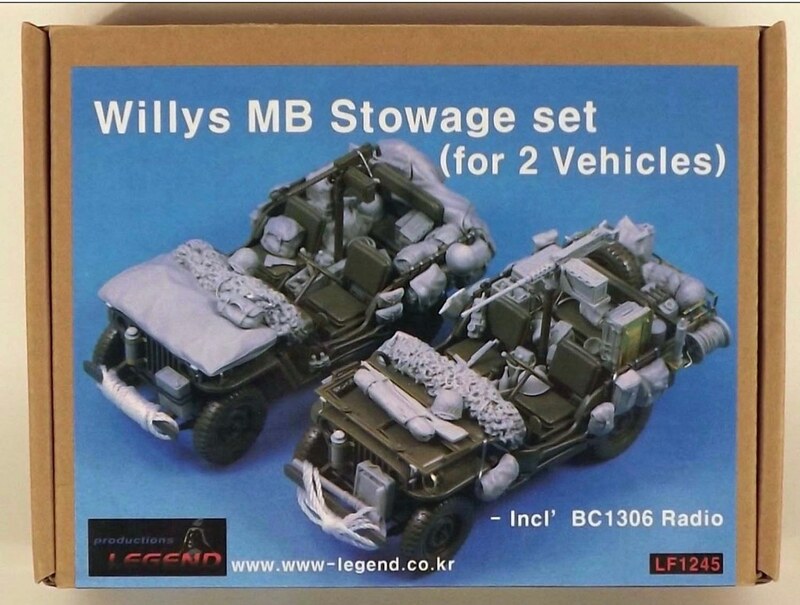 I also orderd a Legend stowage set that will repesent what we see in the photograph below. 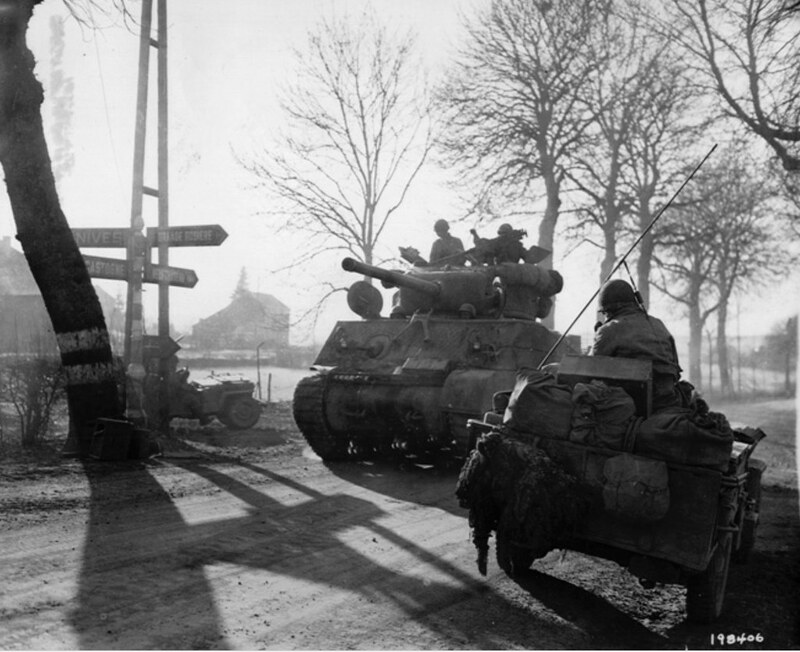 Sherman tank of the 9th Armored Division's CCA on the road to Bastogne. Sgt., are you trying to replicate the Sherman in the photo? If you are, you have the wrong Sherman. The one in the photo is a later A3 with the T-23 turret and 76mm with threaded barrel and thread protector. You might have kitbash another Tamiya kit, but the Armor experts like Rob G. would know. I'm an armor newbie. On the Shaddock website is an actual verified 9 AD A3 knocked out sometime 17th December 1944. You guys are amazing! Just amazing. Sarge, I can't wait to see the finished diorama. It's really going to be something. I remember seeing a program as a kid, The Twentieth Century maybe, narrated by Walter Cronkite, about the "Battered Bastards of Bastogne." In the film, the ice on the road was so thick that a Sherman tank was sliding sideways through an intersection. This thread is a build log, right? Thanks a lot for the info, now I know what you're up to! And isn't the forum great? It seldom works as good as on this one, but when it does - then it's a really good thing to be on! I like this thread a lot, it's about accuracy now! I would say the colour for the jeeps is too light. IMO it looks more like the modern forrest green than the correct old OD - but that's the talk about colours, so subjective. I'd say don't match the colour to what the restorers did - they might have slipped here... Maybe it would be better to find some old ammo can or something like this and match the colour to that? I have an OD ammo can from the sixties or seventies and the best match to it's colour is Humbrol 66 with some future on top of that. I believe you know that the antenna has to be tied down to not whip around and avoid hurting people on the way... Once I have made the tie-down out of a nylon thread taken from a stocking (that's always a fascinating story :-). Maybe you have some use for that trick, too. Good luck with your dio and have a nice day! 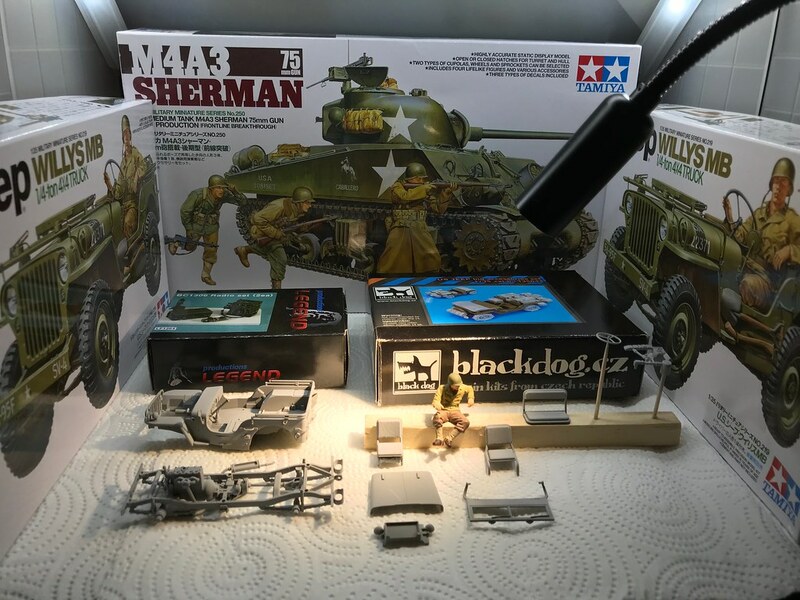 richs26; yes, I am trying to replicate the Sherman in the photo. Thank you for pointing out the mistake. Not only do I have the wrong turret and barrel, but I may also have a problem with the hull. I believe the fender on the right side facing the tank in the photograph indicates the hull was an early production M4, but the fender on the left side and the front of the hull indicate the M4 was a later production. 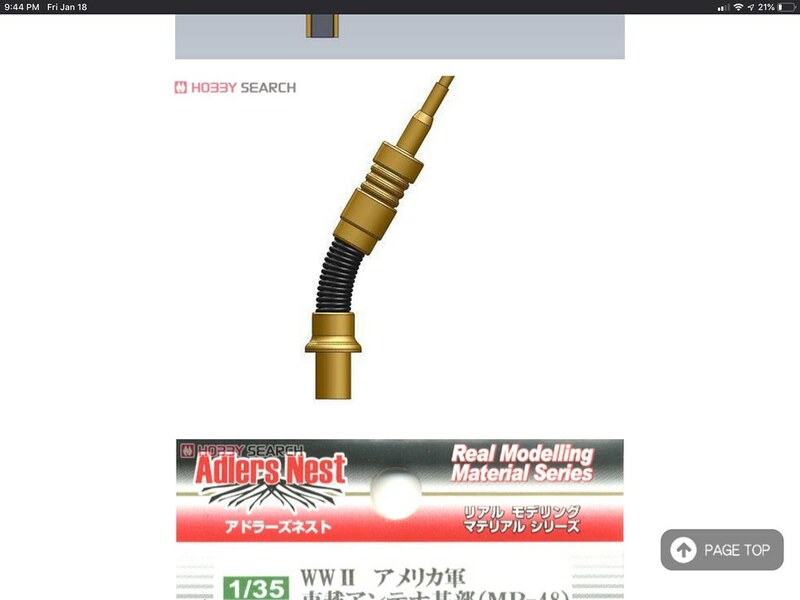 So, I need to resolve that difference and possibly look for a Tamiya #35190 model. 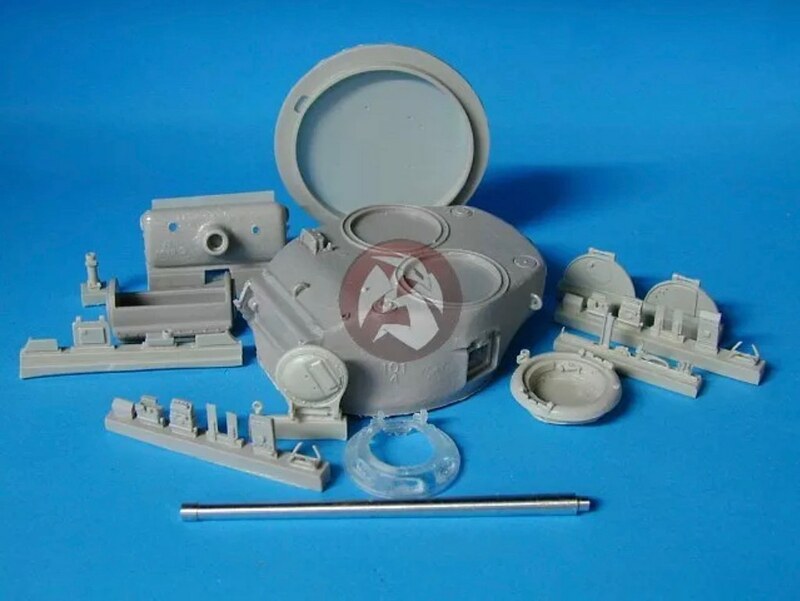 I can easliy add a resin T-23 turret with round hatch and metal 76mm barrel, see photograph below. fotofrank, part of the fun in scale modeling is the research and effort to accurately replicate an event from history. I have watched the video 'Battered Bastards of Bastogne' and it was very well done. Ixion, I believe I found the original house visible in the background of this 1944 photograph. 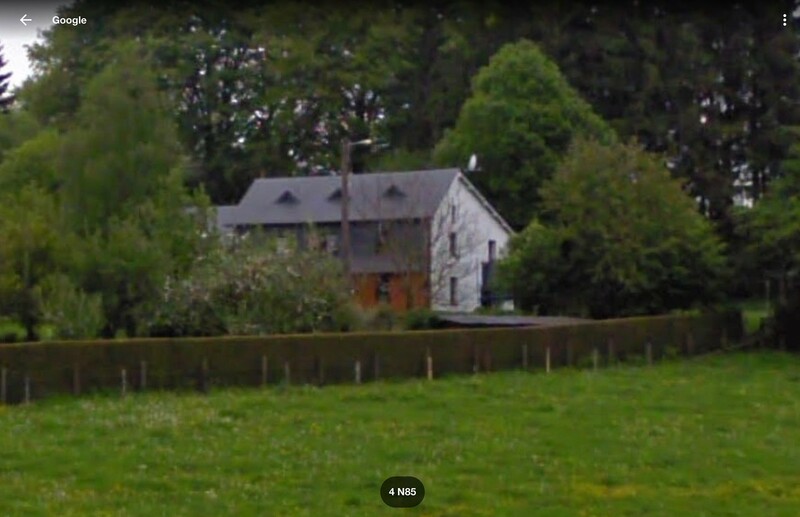 I used your link and went down N85 (Rosiere la Petite) in the direction of Neufchateau past the buildings along the road and turned the camera left and back across the field is the house above. It has a distinctive roof which we call 'saltbox style' in the U.S. where the front of the building is two story and the back is one story. The owner has added three roof dormer 'eyebrows' but that is easy to do when the roof is replaced. Yeah, I didn't mention it yesterday, but I did some "driving around" and spotted the house too, hence my "historic view" comment. Pretty cool! I "drove" up and down the highway, imagining all the relics that must be buried in the farmer's fields or hiding in the woods, what sorts of hardships the men endured there. It's like revisiting the past without actually being there. If you take the road towards Nives and turn at the first right, you can go up the alley a ways and see the house. It's a great way to get a feel for the surroundings, the vegetation and buildings, before one starts building a diorama. I use Google Earth a lot, which is why I was able to find the location relatively easily. My other main hobby, apart from modeling, is rockhounding, and I use Google Earth, with geological map overlays, (plus a degree in geology) to recon my target areas before I venture out in the field. It greatly improves my likelyhood of finding what I'm looking for, while minimizing unnecessary bushwacking.